Last month’s newsletter indicated our concerns about poaching by ill-informed locals. Underpinning these nefarious activities is a need to earn cash – poverty is widespread in the communities adjacent to Kruger Park. It is critically important that the owners of Game Lodges and Safari Operations put something material back into the local communities. It is chillingly contrasting to see luxurious lodges within game reserves only a few km from abject poverty in the adjacent villages. Of course the lodges and safari operators offer employment to the local communities, but we need to do more – the communities have to believe that they benefit from ecotourism. Once this is achieved, the local headmen will easily convince their people that sustaining the game reserves is in everyone’s best interests. Poaching will then be better controlled. Viva Safaris has been doing its little bit for a long time. Apart from our volunteer safari programs, we have regular school and college groups that help uplift the local communities. Some have been coming every year for many years now. Students from MItty High paint Catholic Church in Acornhoek. In addition, some of Viva Safaris’ previous tourists have been moved to collect funds. One such previous guest and now our great friend is Cathy Martin. Viva Safaris has undertaken to work with Cathy to upgrade sporting facilities at the Green Valley School in Acornhoek. Cathy has collected over 2000 pounds from her local community and school in Scotland – well done – your example is truly inspirational ! This month has flown by very quickly. Although we drive in the same areas all the time, it is never boring : we spot different animals all the time. The game reserves are very dry and the water level of the Olifants River is dropping. The game viewing is nevertheless excellent. James and I conducted a Bush Walk with eight guests. These guests really wanted to learn more about the Bush. Out first sighting was of a big herd of elephants feeding. We continued walking towards the Spruit where we almost were attacked by a solitary buffalo, who was clearly unhappy to see us. We managed to get away and everyone was safe and now had a story to take back home. During dinner time at Marula Boma we were joined by four Hyenas. Everyone was happy and some guests were actually shocked to see hyenas that close. One lady wanted to run back to the Cruiser ! After a few minutes two Honey Badgers arrived and the hyenas walked away immediately. Shows you how scared they are of Honey Badgers ! It was a good dinner with some great entertainment ! I am sure that the new Viva product for Sleep Out guests who will be at Marula Boma will be fantastic ! It was very good day for a safari – the weather was perfect. As we arrived at Orpen, we heard lions roaring. It took us almost an hour waiting for them to come out. At last one lioness walked towards the road and the impalas starting going crazy by making their alarm calls. 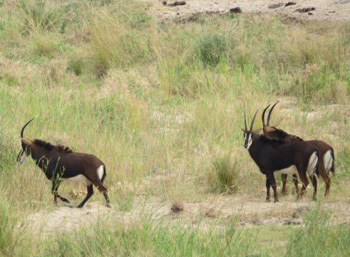 Later on, we drove on S39 and S125 where we spotted four Sable Antelope. Wow ! Sighting of very rare Sable Antelope. On S100 there was a cheetah stalking impalas and we almost witnessed a kill. The cheetah started attacking from a distance and the impalas ran towards the cars. In fact that was how the impalas managed to get away from the danger as the cheetah was reluctant to get too close to the vehicles. This month we had good sightings especially at Kumana dam and the S100 road. We had a pod of 20 hippos on S100 at the beginning of winter but now I can only count 10. In the space of a month I’ve witnessed 5 dead ones – even the Hyenas are so full that they no longer seem to be interested. There were lions moving around the water hole but they also seem very full – too full to scavenge on the dead hippos. Lion with full belly resting in the shade. The Kumana dam lion pride now consists of 25 lions which makes them the second largest pride in the zones where Viva Safaris operates – the mega pride along S100 has 32 lions. The Kumana pride seems to be focussing mainly on buffalo – the herd is looking very depleted ! Between Kumana and Mazithi dams there is a female leopard that we are seeing almost every day! She is completely relaxed and walks along the tar road giving our guests absolutely brilliant photos. Along the S100 we regularly find a cheetah stalking some Impala and waterbuck. So it was very often the case this month that I have shown all 3 big cat species to my guests in one day !! Nsemani dam still has water and game is concentrating there. A pride of lions with 4 females with their cubs is seen every day. We experienced big groups of guests during this July. 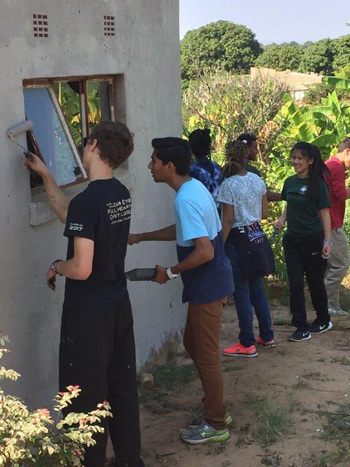 Groups included university students who were doing charity work and also took part in all the activities offered at the lodge. Sightings declined gradually due to the lack of rain whereby animals in Olifants West Reserve have moved further east. We are probably seeing them in Kruger !! Lucky for Viva Safaris compared to the other lodges around here that do not get their clients to go to Kruger !!! Most of the bush walks take place down by the Olifants River and the results are good even if the area is utilised repeatedly. Hippopotamuses, elephants, crocodiles and buffaloes are seen daily along with general game. The temporary drought in the area has something to do with it – we push a bit and find better game around the Marula Boma area and the road to River Lodge. A Buffalo herd continues to frequent the area east of Impalabos and northwest of Rome 1. Billys Lodge area became the hot spot regarding elephants and general game including giraffes. An exciting sighting that we had recently near Tremisana Lodge was of a honey badger and a civet. The river area always gives us hippos out of the water after nine in the morning and guests enjoy the sighting so much. There is no record recently showing the presence of Zulu the Black Rhino bull. A week ago we saw a White Rhino mother with her calf. Full day drives in Kruger have become special as animals hang around the waterholes and it makes it easy for the sightings. Waterholes like Shimangwanini, Sweni, Kumana Dam and Mazithi Dam are the best areas. On several occasions this month, lions made kills in these areas. This month’s Kruger highlight sighting was of some hyenas killing a young buffalo bull. During the killing three male lions emerged and the hyenas left the spot. The male lions took over the carcass but they did not feed from the carcass immediately. Very beautiful leopard was seen walking on the road at Sweni. 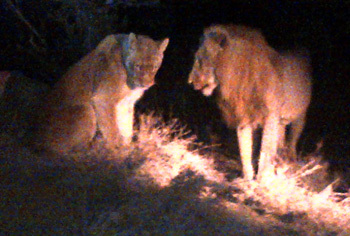 Mating pair on lions at Mazithi was another great sighting of the day. Lack of water along the S100 resulted in some hippos dying and nothing feeds on them. On the 2nd day of July, I was in Kruger, very good day, sighting a leopard crossing about the 3km from the first gate before reception and buffalos in an open area before reception. After the shop a herd of elephants drinking next to the shop. Lions at Timbavati – four lionesses and six cubs lying down on the riverbed – it was a good day. On the 10th, in Kruger again, a female White Rhino and a baby near Rabelais. Lions at Sweni windmill, four males lying down, White Rhinos before Kumana Dam. Elephants at Kumana Dam, Buffalos on the main road near Nkaya Dam, Leopard with his kill – a Civet Cat – up a tree 5m away – close to the road. On the 14th, Lion at Mazithi Dam with a buffalo kill; lion plus cubs and two leopards on S 86 road; buffalos at Kumana Dam and lots of elephants, 4 white rhino. On the 22nd Lions on Timbavati river bed, 4 white rhinos, Shimangwanini dam, lions Welverdiend waterhole Sweni elephants and buffalos, on our way back after reception leopard crossing to Ngala dam and two white rhinos before the last gate. The 25th lioness and cubs lying down before Bobbejaankrans on the riverbed, Elephants Timbavati drinking, Nsemani 3 lionesses; S100 2 Lionesses and 4 cubs stalking waterbucks. Buffalos Shimangwanini Dam, elephant Mundzandzeni, more general game Rockvale waterhole, Buffalos drinking at Orpen waterhole next to the camp. So this month has been quite exciting with great sightings especially of the cats. We have seen a few pretty exciting lions in Balule. On one of the drives here in Balule I heard about a great sighting of a mating pair of lions not too far away. So I sped off and went into the bush and looked all over following the tracks of the vehicle that was there previously. We searched and searched and eventually decided that they must have left because it was dark and we couldn’t see anything. Then suddenly, as we were about to pull out the bushes, we heard roaring like next to us. We spotted the male who got up and started roaring like 5 metres from our Landcruiser which was really exciting and we looked with the spotlight and saw him behind a bush with his female lying next to him. It was awesome. Then on another Morning Drive we managed to find an awesome sighting of a lioness that had killed a baby buffalo in the night with her 2 cubs busy feeding. We stayed with them for about 20 minutes which was really fun because we were alone and we could hear the lions while they were eating. On one of the Sundowner Drives, we hadn’t had seen terribly much but I heard a very familiar sound in the distance that really excited me a lot. It was the sound of impalas alarm calling which is normally only done when they see a predator. So I drove towards the sound going down various roads until I spotted them and found a few lions that they were staring at and alarm calling – it was awesome because the excitement of just trying to find the animals and why they were alarm calling and then finally actually finding them was quite rewarding. 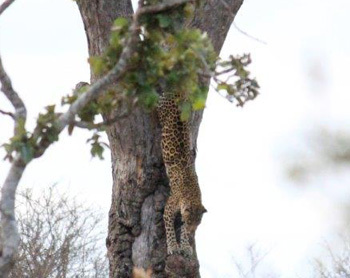 Leopard sightings this month have been really great here in Balule. On one of the night drives we found 3 out of the big 5 including black rhino, elephant and of course the leopard along with a nice cheetah sighting too. We were just driving along one of the main roads looking around after seeing the elephants when suddenly a gorgeous female leopard appeared out of the bush and we followed her for quite a while getting great shots with the spotlight. On another Sunset Drive we hadn’t seen much except impalas, giraffes and kudus and were on our way to the Marula Boma when a young male leopard popped out of the bush and walked along the road with us for a few minutes until it decided to cross the road in front of us and disappear into the bush. Rhinos are normally quite scarce to see – however on one occasion I was really lucky to find a female Black Rhino with her calf right next to the road which was awesome because we had her next to the road for quite a while. Then we also saw elephants and buffalos many times as well as a cheetah that has been hanging around in a certain area for quite a while now we have seen quite a few times. Kruger has been awesome as well as on several days we got the full big 5.On other days we only missed either rhino or leopard. 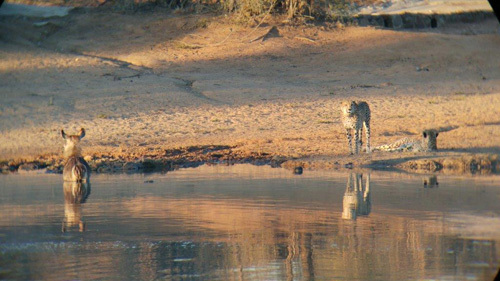 A highlight was of cheetah that had chased a waterbuck into water. Cheetah chased Waterbuck into the safety of water. It has been a great but very busy month. Game viewing has been good but with ups and downs due to the drought causing such bad vegetation conditions to the point where there is hardly any grass left. So the grazers like Wildebeest and Zebra are found rarely while browsers such as Kudu, Impala and Giraffe are around. The afternoon drives this month have been very unpredictable. Just when you think it’s gonna be a quieter drive with sightings, some unexpected sightings happen. Still managed to get 7 elephant sightings and buffaloes on many drives. My best sighting on Afternoon Drive this month was on the 16th. This drive in particular was fantastic and within the first hour and a half managed to have 3 out the Big 5. Started with 3 beautiful big elephants that slowly walked up the hill towards the cruiser near Marula/ Sable junction. They walked right past and one even stopped to have a look at us. The 2nd was a massive herd of buffaloes down at the Olifants River which ended up walking all around us and some even lay down next to the cruiser for a sleep. And just when I thought it can’t get much better… as I drive back onto Marula Road extension there was a leopard that had killed a Duiker and put it into a Marula tree. She hadn’t even started to eat it yet. Absolutely amazing seeing that beautiful animal doing what comes naturally. 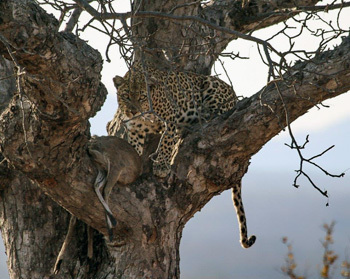 Leopard with fresh Duiker kill up a Marula Tree. Started off great with a pride of lions on my first sunset and elephants. Had good sightings for the guests of which twice was a big herd of buffaloes close to the road and the one drive a female cheetah just a bit in the bush from the fence line. Had some good drives to Bushwalks with mostly sightings of giraffe but the one morning we saw lions feeding on a young buffalo which they had killed next to the road. During the walks we had fewer encounters compared to last month but still had enjoyable walks. During the walks along the river we saw the hippos in a pool of water in front of us on all the walks and the few occasions with the hippos lying on the sand bank in front of us. The month started off with a bang. I went to Kruger National Park almost every day. Although the days are long it is absolutely worth it and so very rewarding. The tourists from Marc’s Camp are enthusiastic to learn more about the animals and about conservation. In terms of animals we have had amazing sightings. There has been a lot of action near Kumana dam where we have found over 20 lions on Buffalo kills. One day we had an Elephant bull chase a male lion away from the water – makes you wonder who the king of the jungle really is. It seems like the lions have been interacting more and more with the vehicles coming mere metres away from our open vehicle. Just recently I have had the most amazing experience with guests at Nsemani dam with 3 Elephant bulls. They were taking a bath and playing, trumpeting loudly as they approached us and crossed the road making our insides tremble. Just before that we were on the H6 at a hyena den with her pups. Another amazing experience to see a pup that young play with mom. Leopards have been elusive as always but we have been extremely lucky a few times when they showed themselves walking in the open past the vehicle. These close up experiences are rare but do happen at unexpected times. Leopard climbing down tree near Kumana Dam. Apart from all the amazing animals I have seen and their interaction with each other I have had the privilege of meeting amazing people that really want to make a difference. People concerned with the conservation of animals and the environment wanting to make a difference and understand the situation and challenges we face in our industry. The last few days driving to the river to go do bushwalk have been some of the coldest days I’ve ever experienced in the bush, but only hours later it gets back to the warm temperatures. Although it has been pretty quiet down by the river we still get to see some very nice hippo sightings and if we are lucky we get to see some massive crocodiles. With morning drives we are welcomed by the beautiful sunrise and the regular sightings of jackal, elephant or buffalo! 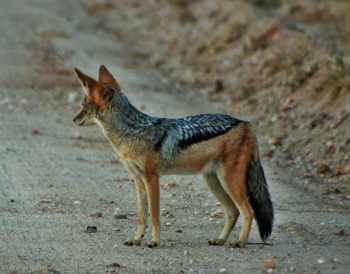 Black-backed Jackal on the road. Afternoon Drives have been very good at the moment. We get to see some amazing sightings not just of big animals but also of some very nice and interesting birds. We were very lucky to see a secretary bird recently. This month has been a very short month for me due to the fact that I went on long leave. But being back in the bush puts a smile on my face and a calmness in my heart! The bush walks along the Olifants River have been great, with a variety of sightings, the most memorable being that of a herd of six bull elephants, walking along the bank of the river. They slowly moved smelling the air as they walked away from us, then as if in sync with one another they slowly waded into the shallows and enjoyed a midmorning drink. The hippos have been seen regularly, sitting in the shallows waiting for the winter sun to heat them up, before venturing out the water to bask in the sun. We managed to get impressively close on many occasion to observe these interesting beasts in their favourite place, the water. Along with the hippos, crocodile sightings are a regular occurrence along the river. We often spot them basking in the sun, along the river bank. The biggest being as large as 4 meters in length, quite an impressive size. 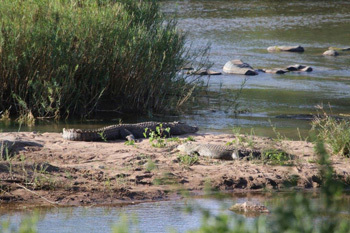 Crocodiles emerge from the Olifants River to bask in the sun. The sunset drives have been packed with highlights. We have been very lucky with our elephant sightings – a few elephants REALLY close to the vehicle as well as near Marula Boma, our dinner spot. Lions have been tricky to find of late. However I have been able to enjoy a few great sightings on both my sunset and sundowner drives – the best being a pride of six lions and lionesses feeding on a kudu – a meal this size didn’t take them long before they were done. We sat and listened as they chewed through the cartilage and bone, snarling at one another. 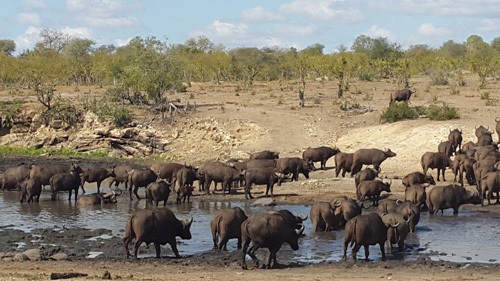 The buffalo have graced us with their presence on many occasions, often around the water hole in front of Tremisana Lodge. I’ve often found them in the early morning moving away from the dam in search of food and in the late afternoon, heading towards the dam in search of water. The bush is unfortunately looking very dry, we hope for a very wet summer this year, to give the animals something to eat. The great expanses of Kruger have been a happy hunting ground for the big five this month, with many guests returning to the lodges with impressive lists of animals seen. I report on a safari I conducted into Kruger, with a vehicle full of guests, all very keen to see the Big Five. We headed through the Orpen Gate, only to stop soon thereafter for a herd of buffalo, feeding along the roadside. The big bulls all looked up simultaneously with very grumpy faces as per usual, the cows simply kept feeding, some of which were followed by young calves of only a few months. The start was great and continued to improve as we headed towards Satara rest camp, via Sweni road. This is a beautiful stretch often good for the big cats, and it proved to be a great choice. Not far along the route we came across a small grouping of tourists in vehicles, all peering into the bush. There in the short grass, catching a few hours of shut eye, were three big male lions sleeping flat on their sides, with full tummies. We sat and watched their stomachs move as they took in deep breaths, then much to our enjoyment the one male lifted his head and posed for us beautifully. On approach to a manmade water hole, we hit an elephant roadblock – the whole herd began to cross the road in front of us. Leading the way was the big matriarch, followed closely by the youngsters. We enjoyed watching them drink water, tossing it into their mouths with their trunks. After a pleasant lunch at Satara rest camp, we continued on our search into the afternoon. We managed to find more lions, this time an even better view of a female walking across to greet another lioness. Lions are social cats, and often show affection to one another to improve bonds within the pride. The leopard didn’t make an appearance on this particular day but we did however spot six White Rhino late in the afternoon, making it a very successful day in the Kruger National Park. Marc’s Treehouse Lodge has been extremely busy this month which is very good news. On many occasions our clients have returned with their sightings of the Big Five in Kruger National Park which they have been delighted with. Guests are also extremely happy when they are lucky enough to find the Cheetahs. We are extremely happy to report that we have had one night of light rain and the next night much heavier with lightning and thunder to boot. We can only hope that this trend continues as we are still desperately wanting proper rains. That which fell was soaked up immediately by the parched earth with very little run off. Hopefully this little bit will be enough to start the grass growing and enable the trees to keep what green leaves they have to enable our browsers to continue feeding. Tonight (27/7) we have our first “Sleep under the stars” guest Negin. Hopefully this exciting new concept introduced by Viva Safaris will be popular. Until next month, God be with you. Katekani started the month extremely slowly and even faltered mid-month. However like the true thorough-bred that Katekani is, she surged to the finish line with a full house. All rooms booked with maximum clients. So nice having such an International table. A family from Denmark, a couple from USA, a couple from Germany and a couple from Italy. The interaction and banter between them is amazing. A big thank you to all our booking agents. A comment that we are becoming really familiar with from our guests is recurring consistently. “The pictures of the rooms just do not do them justice” Our family of four from Denmark were so impressed with their lodgings they immediately extended their stay for one night. We were, of course, delighted with this. Ecstatic can be the only word how we feel about the rain that we have had, whilst not enough to fill anything, every bit helps. A big thank you to Sandra for our new staff uniforms which are really great. We have built 2 new staff rooms as a result of the increase in our tourist numbers. We have upgraded the public toilets near the Boma. We have added 3 more car ports for more vehicles. Looks like Viva Safaris is on a roll ! The Tremisana Dam is now the ONLY dam in the greater Olifants West area that has substantial water. Great news as we are having all the animals on our property. What is happening is that animals are nipping in and out – they quench their thirst and move off in search of ever dwindling grass supply. The Sleep Out safari option is off to a slow start – perhaps it was because it has been extremely cold. We have more bookings for August and September. We supply each participant with a sleeping bag, blanket, pillow and towel. At the three sleep out venues (Marula Boma, Campfire and Marcs) we supply 15 cm thick mattresses. At each venue, there is a toilet and hot shower. In the event of rain, we have covered areas. On day 2, the guests have lunch at Campfire and can swim in the pool before departing on the afternoon walk. At all 3 venues, we have an armed guard on duty throughout the night. I could write a novel about how amazing of an experience we had! From the food to the accommodations to the game drives themselves, everything was wonderful. The staff were all so helpful, friendly, and knowledgeable. We saw so many animals! Balule is such a treat to drive around, and Kruger was magical. The rehabilitation centre was a neat hands on experience. Rex and Patrick were the absolute best guides! Thanks for the experience of a lifetime! My daughter and I spent six days at Tremisana Lodge recently. We had such an amazing experience! All our guides in Balule and Kruger (Rex, Patrick, Luke, James and Murray) were fantastic. Patrick found the Big Five before noon in Kruger! The staff at the lodge were wonderful too. Special shout out to Paulina who made lactose free food for me at each meal without me ever asking! Her homemade bread was amazing as well! We enjoyed the grounds, seeing animals right from the breakfast area, the Bush walk, the Bush Braai, the Rehab Centre, all the sunrise and sunset drives, two full days in Kruger and so much more! The people we met from India, Columbia, Australia, Belgium etc were all such down to earth and lovely people. From the moment we were picked up in Jo’burg until we were brought back six days later, we feel like we could not have had a better experience than we did! If you’re doing a safari and need somewhere to stay I suggest Marc’s Treehouse for a couple of nights. We stayed in the treehouse and it was awesome! The sights were amazing. We thought we would be really cold but they provide blankets. AMAZING hospitality. Victor was a great host. Marc’s Treehouse Lodge was a very nice resort with great food provided, very nice tree house accommodation and a 20 minute drive from Kruger national park. The game drives included and morning bush walks were a fantastic experience and I got to see all of the big 5 and many other animals in Kruger and in Motlala Game Reserve. The resort itself is un-fenced which is a great addition making you feel even closer to the animals. The treehouse I stayed in was actually situated on ground level on the edge of a river bank, with a balcony looking out on the below river. Room was very spacious, comfortable bed and had an en suite bathroom with shower. 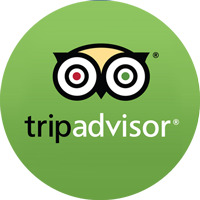 The staff were extremely helpful and friendly, especially Victor who was a great friend of mine by the end of my stay. WiFi was only available at the bar area but nice to be disconnected while in the middle of a wildlife reserve. Trip to Blyde River Canyon on the way back to Johannesburg was truly incredible, one of the best parts of my trip to South Africa. I would highly recommend staying here, very reasonable and worthwhile experience for the price I paid in my opinion. My girlfriend and I recently spent x4 nights, 5 days at the Katekani 4 star lodge (which should have a 5 star rating). From the time we were collected from Jo’burg we experienced nothing absolute professionalism. The drivers were conscientious and knowledgeable. They were accommodating on the long drive back to Kruger. 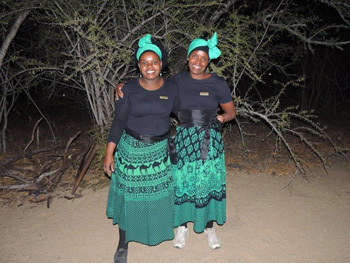 Once at the lodge we met our fabulous hosts who were warm, welcoming and hospitable. It was like being amongst family. The food was delicious and we never felt rushed or stressed. We found a piece of paradise in amongst the many fantastic game drives. The accommodation was unlike anything I’d ever experienced for glamping. With a wading pool on the deck, 2queen sized beds and two basins, there was plenty of room for two women that enjoy personal space. As far as the game drives went, the timing was excellent. There was ample time to relax in between drives and meals. Visiting private parks gave us additional time with the guides and an opportunity to get close to the animals. I was very impressed with Katekani Tented Lodge and would highly recommend them to anyone that would enjoy the wild with a touch of luxury. I’m already planning my next trip and I haven’t even arrived home. We recently returned from four nights at Katekani Lodge, and I have never felt more cared for at any other type of lodging. I wasn’t sure what to expect from a “Tented Lodge,” but the accommodations were gorgeous. Our giant room had two queen beds, two comfy armchairs, a double sink, toilet, large soaking tub, and a shower inside, as well as a mini-fridge, and electric kettle. Outside, we had a gorgeous private deck looking out into the bush, with a splash pool, outdoor shower, and two nice lounge chairs. In winter, it was too cold for the pool, but it will be amazing during the summer. The rooms have two concrete walls and two canvas tent walls, so they felt much more stable and private than most tents. The winter was chilly and windy two of the nights we were there, but we were still quite comfortable (although showering was a little chilly). Right now, the property only has four guest rooms, so it is very quiet, with lots of privacy. If you are looking for a bustling lodge with dozens of other guests, look elsewhere, but this is the place for a peaceful, relaxing environment. While the facilities were beautiful, the staff really make Katekani special. For most of the time we were there, we had the lodge to ourselves, and the staff made sure we had absolutely everything we could have needed or wanted. Every evening, they put hot water bottles in our bed so that they would be warm when we were ready to go to sleep. They washed some clothes that I had gotten muddy at no charge. They always made sure we had water, blankets, and anything else we needed for the day’s activities. Every meal we had was extraordinarily delicious, and we could always count on being greeted with a huge smile by anyone of the property. Most of all, Allen and Elena, who run the lodge, are simply kind, wonderful people who we thoroughly enjoyed spending time with. Katekani far exceeded our expectations, and I cannot recommend it highly enough.